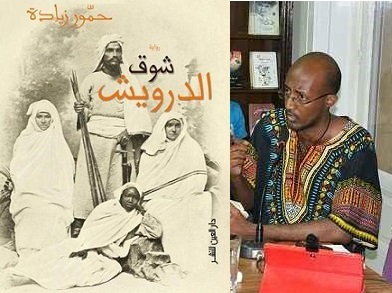 HZ: These are novels that come from the same distinctive Sudanese cultural world. You’ll find jinn in The Longing of the Dervish and The Jingo, living dead in [my first novel] The Kong, and in Khalid Oways’s novel Keyah, and you’ll find Sufi sheikhs walking on the water and multi-locating in Tayeb Salih’s The Wedding of Zein, and in my works. This is a one cultural environment. Mahmoud Mostafa is a Cairo-based journalist who works for Daily News Egypt. Are any of his works translated into English? Sadly after twenty five years, my Sudanese Arabic very rusty but I am still involved and keenly interested in Sudanese culture and eduction. Several of Amir Tag El Sir’s novels are translated to English — The Grub Hunter, French Perfume, and Ebola ’76. Hammour’s latest novel will be translated and published apace by American University Press — that’s part of winning the Naguib Mahfouz Prize. Also, a couple of ArabLit’s contributors are currently putting together a collection of Sudanese short stories. See: https://arablit.org/2014/08/27/how-to-separate-mediocre-good-and-great-stories-in-translation/ I will be sure to let you know when that’s available. Thank you so much for your kind reply. Your website is an inspiration and a powerful vehicle for understanding and peace. I would be very interested in reading the Sudanese short stories – getting both the original Arabic and the English translation would be a great way of improving my horribly rusty arabic. When the collection is ready, I’ll certainly post about it…and hopefully Raph & Max can point you in the direction of the Arabic versions as well.